Give your kids--and yourself--something to rise and shine about! 75 recipes that make the first meal of the day worth waking up for. Rise and Shine is the answer for every parent who has struggled to get breakfast on the table and to get their child to actually eat it. With 75 breakfast recipes that are entry-level-easy, with at least half requiring no more than five minutes of hands-on prep time, every delicious recipe is an exercise in good nutrition and good taste. Written by a nutritionist with three children, this book arms parents with tips, recipes, and inspiration for making a nourishing breakfast doable and delicious. Rise and Shine is made for busy families and busy mornings, so when breakfast isn't the priority, you can still eat something to start your day off right. 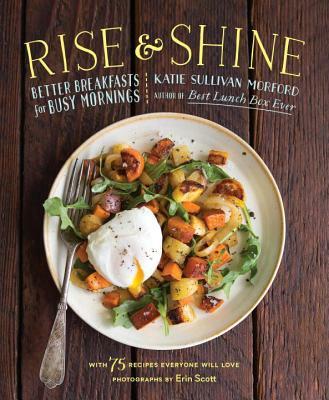 KATIE SULLIVAN MORFORD, MS, RD, is a freelance food and nutrition writer with more than twenty years of professional writing experience. She has been published in the New York Times, the San Francisco Chronicle, Real Simple, Cooking Light, Bon Appétit, Shape, Self, and Fit Pregnancy. She is also on the advisory board of New Parent and Baby & Toddler magazine where she consults on nutrition-related content. Katie is the author of the cookbook Best Lunch Box Ever (Chronicle Books, 2013), and the the blog Mom's Kitchen Handbook, which she launched in December 2010. When not cooking, you can usually find her curled up with a book, practicing yoga, or traveling with her husband and three daughters.